Let me draw it, and I'll do pirate, zombie, ghost, comic book hero... whatever the heck you want, lol. Zombie would fit very well with Walking Dead prizes though, I'll note. Thanks for all the gratzes. 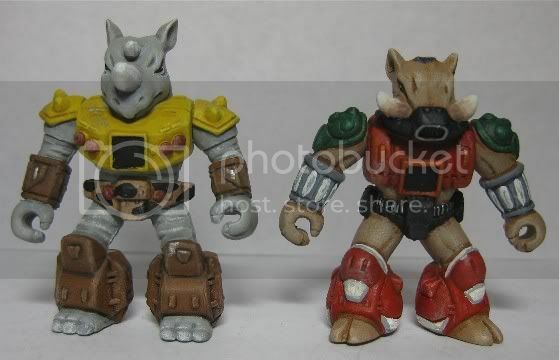 I just want to say, now that all is said and done, part of me REALLY wanted to do Bebop and Rocksteady Battle Beasts for this contest... but there are two of them, and the contest only allowed for one. I thought perhaps I'd call one my official entry, and one just a bonus, not up for judging... but I really didn't want to bend/violate any rules. Plus I know at one point it was said that entries could cross over, but it was also said they had to be your own creations... so there was grey area I wasn't clear on. If they'd be valid. lol. Not just minimates OF them mind you, but Rhino and Warthog Battle Beasts. Their heads would be similar, and their color schemes probably too, but they'd have been armored and whatnot from the neck down. They're not minimates, but I did these repaints of original battle beasts a few years ago. Congrats, guys! I really like that a "real" custom and a design won the first two spots! Well done everybody. Defenitely one of the best custom contests in the last few years. Because my drawing and bio was some how less "real"? Everyone seemed to have very real and valid entries. Unless you put the "real" in quotes, as he did, to emphasize that the other entries are really no less real. He was just saying it was cool that one winner was a physical custom and one a drawn design. Sorry, sometimes English not being my mother tongue produces problems where I don't see them. Again, I was especially glad because with those two winners the physical minimate customs (aka "real" in quotes for the lack of a better word, not for other customs lacking to be real) as well as the drawn ones (with pen, paint, photoshop, fancy Ivan style or whatever - and please don't try to argue that those are also physical, I guess that way we'd produce pseudo problems) were represented and therefore respected by the voters. I was just about to suggest this actually. A survivor would fit much better in TWD theme. Congrats winners! PM me your shipping info and I will send your prize packs out this week! Clearly that means that they don't want their prizes and that you should send one of each Vorin to me! Thanks Lurch, not sure what happened. I will send them out ASAP! Totally missed to whom I should send my addy. I just responded to Lurch's pm. Sorry YB! Yeah, sorry, I just saw the message from Lurch77 and I just responded to that message. You asked for mailing info in the thread, but Lurch did the PMing. Frankly I was half-confused about it, and wondered if I should bring it up soon, but was beaten to the punch, lol. Anyway, I just PMed it. Just incase. Winners, your prizes have all been mailed out, and you have been PM'd the tracking info for your shipment. Please let me know that they arrive safe and sound. I got my prize pack on Thursday and want to thank everyone who helped make this contest possible! The poster is amazing and having both Vorins (so far) is great.